^^This sweater was the very first thing that caught my eye. I’m so obsessed!!!! ^^Current Elliott makes my favorite tee shirts. The color and the ruffles on the sleeve sold me!! I love that I can wear it now and in October! ^^I just am drooling over the blush pink velvet heels. ^^Look how cute the back of this top is. I love how it goes longer. Such a fun and unique top!! I love the floral embroidery. ^^Another great Current Elliott Tee find! Theres a hint of sparkle. And don’t get me started on the Adidas. I’m wearing them to my cardio class this morning!!! 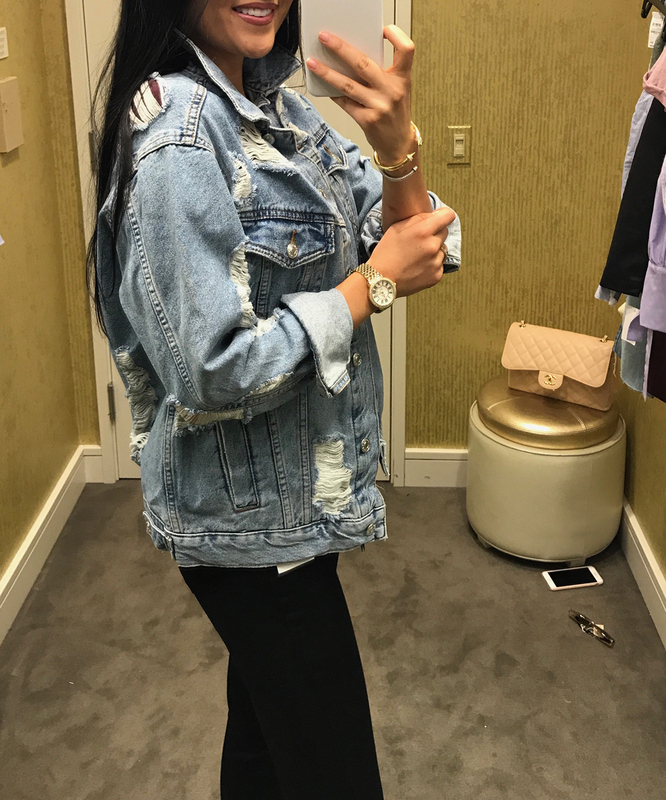 ^^Loose fit distressed denim jacket. Staple! Perfect layering piece! ^^Classic and casual. The leopard slides overall were one of my favorite finds!! Such a fun pop to any outfit! And I love the Bordeaux boyfriend sweater too! 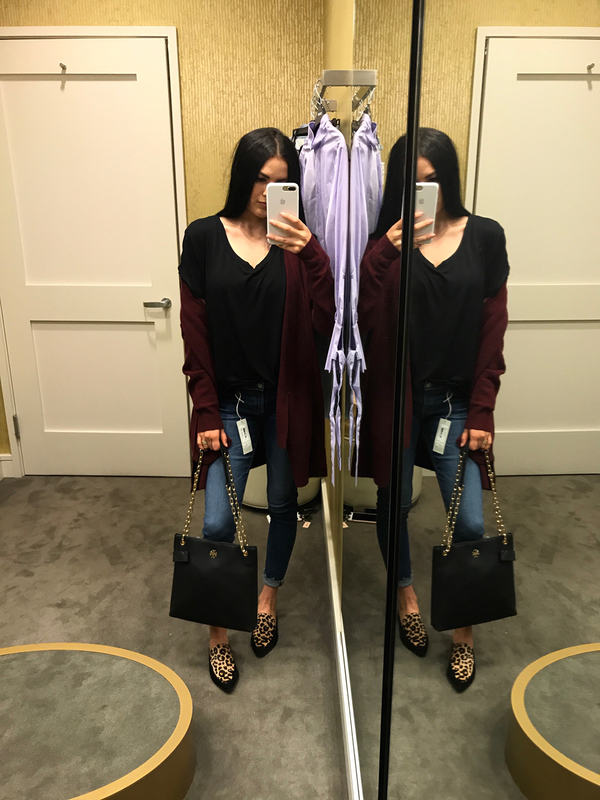 The Nordstrom Anniversary Sale (early access) officially started TODAY! Last night I got to go in with my sister to shop and have a peek at everything that’s a part of the sale and we were both dying over everything we found! 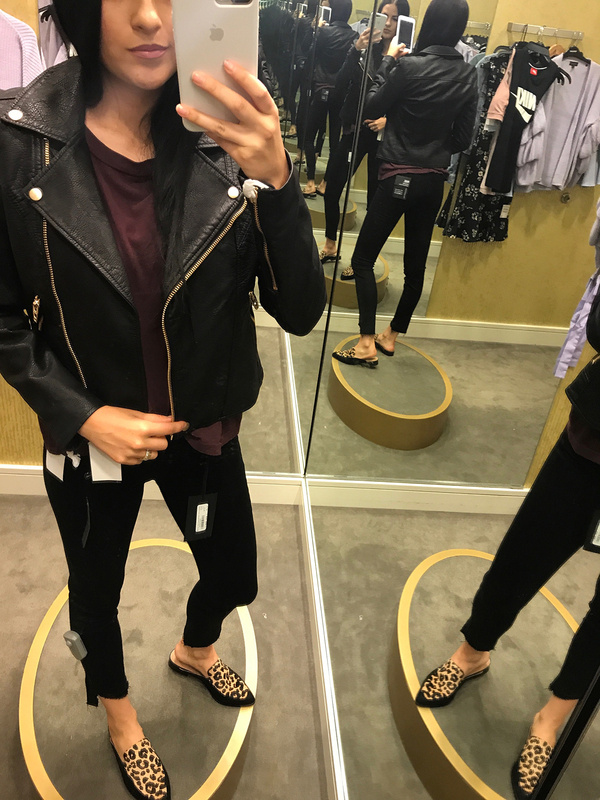 Every year I stock up on pieces that I know I’ll wear all fall and winter long, so here’s a few of the things I bought! I’m dying to know…what are some of your favorite pieces from the sale?! Do you like what I picked? Start shopping the full sale here!! I am so in love with the jeans on the first picture! Those FRAME jeans are amazing!! SO many cute pieces! I love the ruffle sleeve sweater, the blush heels and the pink Adidas! I love the Nordstrom Fitting room! The best sale of the season!!!! I love all of your looks! I will be buying that black leather jacket for sure- such a good deal. That navy white trimmed sweater is adorable! I have some amazing navy knee high boots that would go well with that! The green floral embroidered top is pretty on you! Loving all of your picks!! The BEST sale!! Cute finds! Love the Nordstrom sale!! I got those velvet heels too and they’re SO GOOD!! 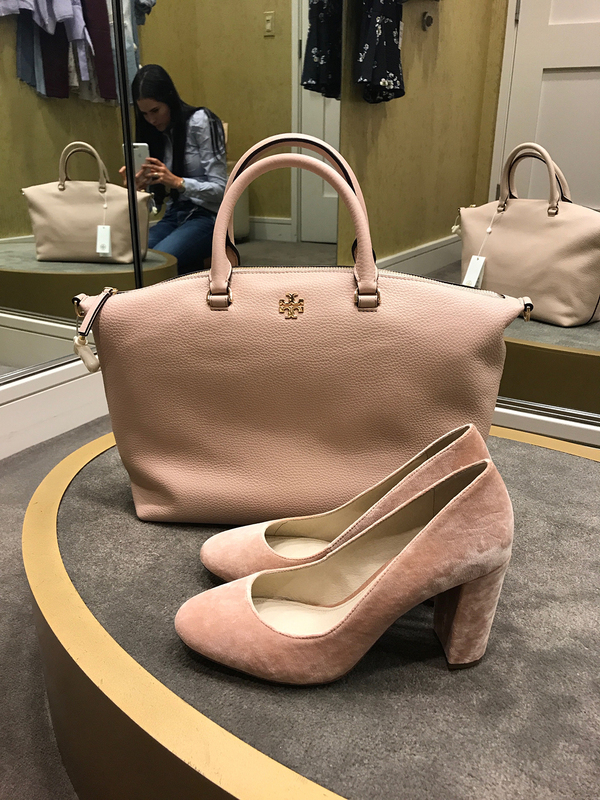 I am loving the blush Tory bag! You’ve got great style, girl! I enjoy following you! 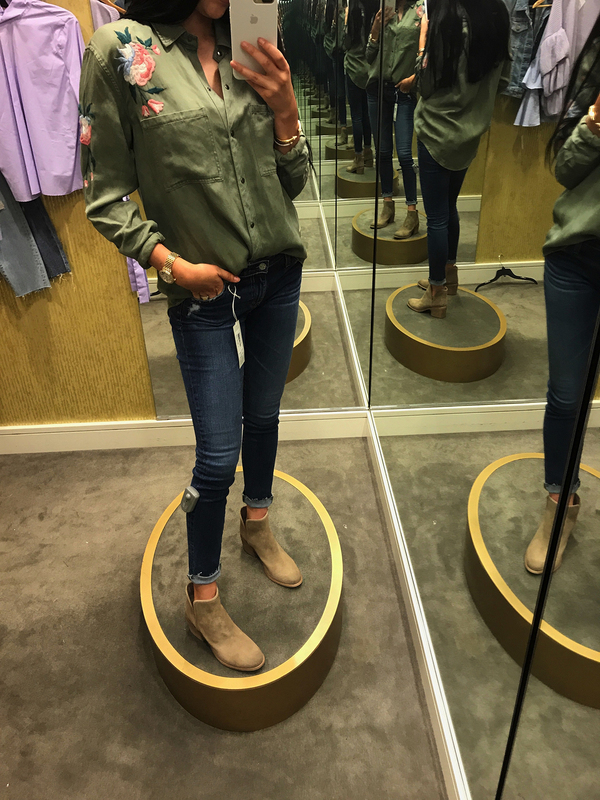 I shopped yesterday as well – The Stuart Weitzman Boots are a must! And the Ugg Camel Tall Boots (Daley) I think. Also the new Nordstrom Cashmere sweaters especially the Gray one..and the Velvet Joie Skinny pants. So many good finds! Thanks for your rundown! Hiya! Every year I stock up on Hanky Panky low-rise thongs, this year I’m eyeing that ALLSAINTS Mast “crossbody tote” in the light blue, great price on J Crew toothpick jeans, a few basics for my husband, and I’m still unsure on shoes! May warrant another look… ;) I love the energy in Nordies this time of year, it’s *ahem* a bit addicting. 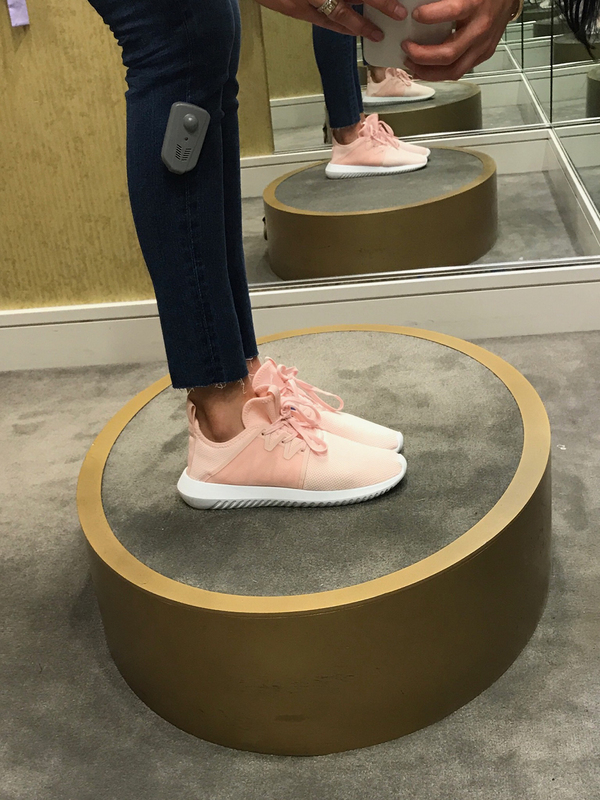 Do you feel like the blush pumps run true to size? Love your blush picks, Rach! Yayyy #NSale! Love all of these looks! This is my favorite sale of the year for sure. 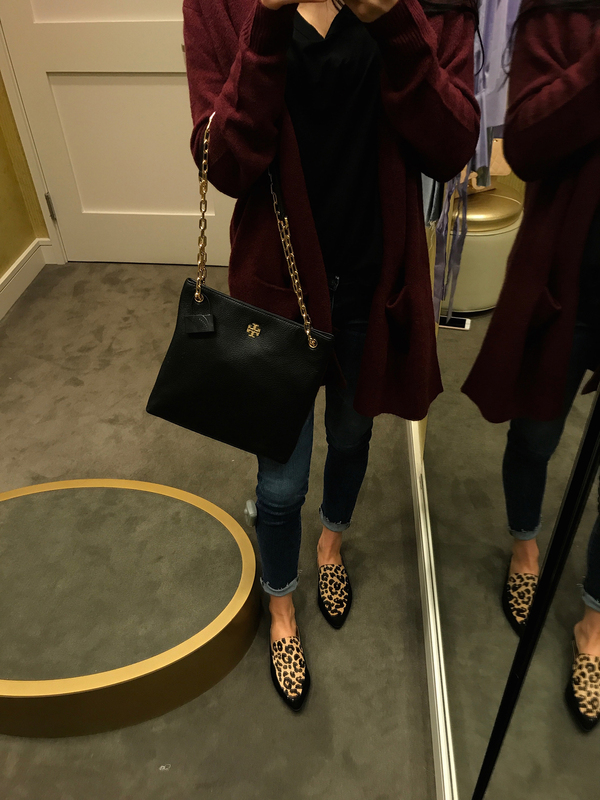 I love all the items in this post, especially the leopard slides! Wow what a good curation! My favorites were the navy mid sleeve top, the pink velvet shoes, and those drool worthy adidas shoes! Awesome choices all around.